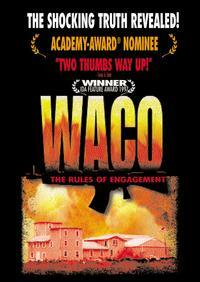 Waco: The Rules of Engagement the much ballyhooed "documentary" on Waco, is a hoax. It is an effort to muffle protest over Waco under the guise of protest and opposition. The first thing to know about WTROE: It is not about the Rules of Engagement. The phrase appears but once in the whole video in a minor incidental scene. The second thing to know is that the phrase is essentially military. Only military forces set "rules" and "engage" an enemy. Police forces work with laws and rights. See The New Military and the New Paradigm. The title was apparently chosen for this video as a signal that it would be military propaganda with no discussion or recognition of rights, laws, or other elements of police work. The video has no foundation in such things. Morally, ethically, legally, factually, and logically, it is utterly adrift. In a word, it is war, where logic is Pablum and there are no rules. It hides the most damaging truths, misdirects attention to false issues, neutralizes outrage at the massacre, and chills sympathy for the victims. It forwards murder charges based on weak evidence; once the charges are discredited, the public will be inoculated against considering real evidence that the Davidians were murdered. A text version of this review, PK zipped for ease of wide distribution, may be obtained by FTP. This review is covered by the Museum copyright, which is designed to facilitate the widest possible distribution in its original form. Much of the content of WTROE is public domain and cannot be copyrighted by the video's producers or anyone else. The video's producers may claim a copyright on the text of the personal interviews done for WTROE and the narrator's words. However, given the subject matter of the video and its intent as revealed by the this review, the Museum holds that the public has an overriding interest in having the full text available for examination, outside the bewildering stew pot of imagery presented in the video. Therefore, the Museum makes available the full script of the Waco: The Rules of Engagement. [Readers are advised that different versions of the video may exist.] Script of Waco: The Rules of Engagement, Part I Pages 1 through 10 Script of Waco: The Rules of Engagement, Part II Pages 11 through 20 Script of Waco: The Rules of Engagement, Part III Pages 21 through 30 Script of Waco: The Rules of Engagement, Part IV Pages 31 through 43 A text version of the script, PK zipped for ease of wide distribution, may be obtained by FTP. This script may not be available long. If interested, copy immediately.